Santa's Surprise Is Running Hot! 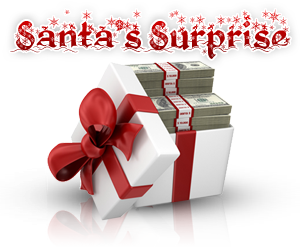 Fly Casino's Santa's Surprise has already given out huge rewards to our members and we are just getting started. Over the next week Santa will continue drop by Fly Casino and dish out an exciting reward everyday! Make sure you login into your Fly account daily to see what we have in store for you. You will be surprised. Login everyday during December 15th, 2013 and December 20th to see what Santa has in store for you! Each day is something different but we can't tell you what its going to be…it's a surprise.